Viknesh Vijayenthiran June 8, 2017 Comment Now! 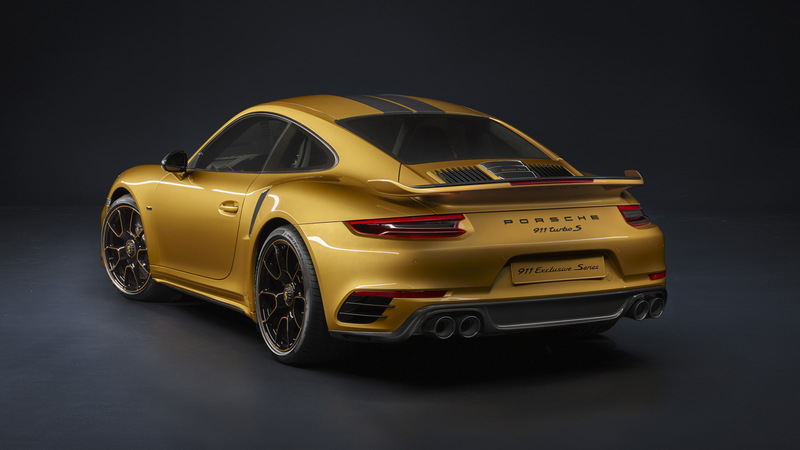 Porsche’s 911 Turbo S certainly isn’t lacking in the performance department, but the German sports car marque has decided to introduce a more powerful, more exclusive version nonetheless. 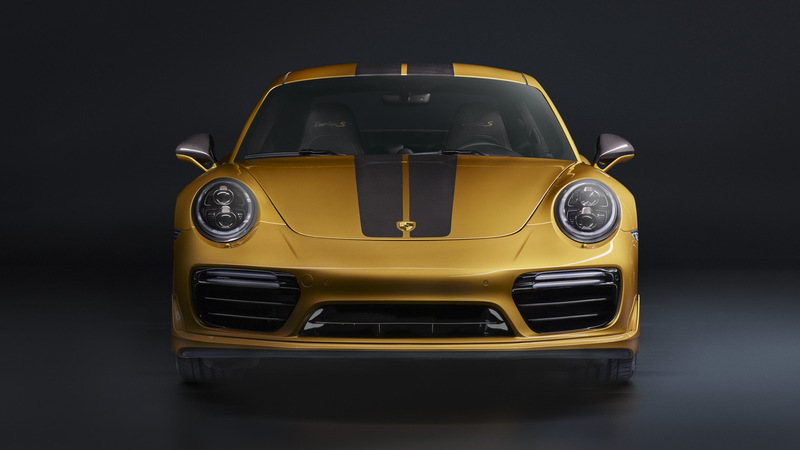 Meet the 2018 Porsche 911 Turbo S Exclusive Series, a limited edition model that makes 607 horsepower and 553 pound-feet of torque from its 3.8-liter twin-turbocharged flat-6. That’s up from 580 hp and 553 lb-ft in the regular model. This results in the car accelerating from 0-60 mph in 2.8 seconds and requiring just 9.6 seconds to cross 124 mph. The top speed is 205 mph. 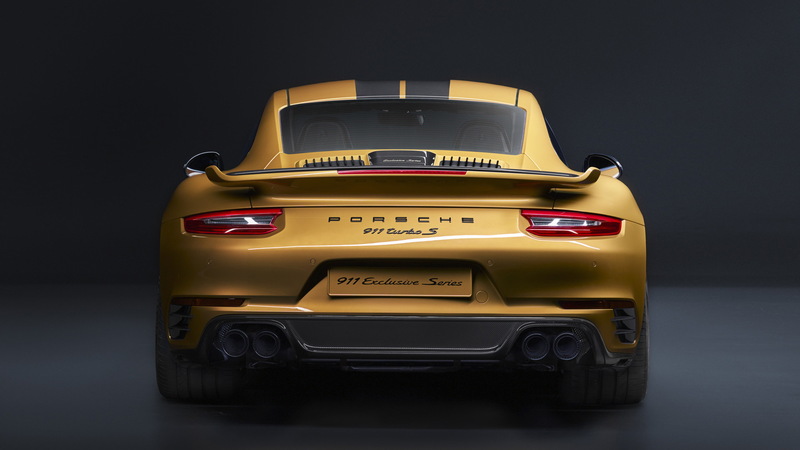 Being a Turbo S, the car comes standard with a 7-speed dual-clutch transmission and all-wheel drive. 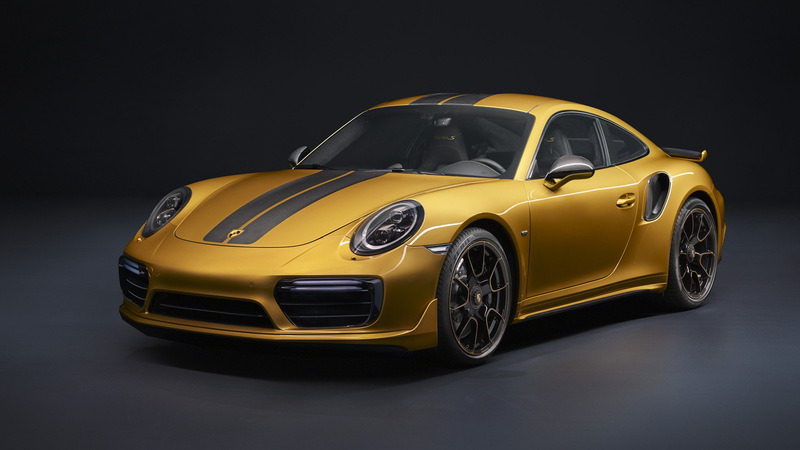 The car also comes with 20-inch center-lock wheels painted in black, with highlights carefully finished in Golden Yellow Metallic using a new laser technology. And for the first time, the brake calipers for the carbon-ceramic brakes are available in black with the Porsche logo in Golden Yellow Metallic. The same Golden Yellow Metallic is used for the exterior of the car and on some accents in the cabin. Contrasting this are carbon fiber accents. The rear view is characterized by the rear wing of the Turbo Aerokit, a new bumper insert, and a black finish for the exhaust tips. Inside, the 18-way adjustable sports seats are covered in perforated leather while the roof lining is made of Alcantara. Fine copper thread is integrated into the trim strips of the carbon fiber interior package while a limited-edition number on the passenger's side further adds to the exclusivity. Porsche will build just 500 examples of the car for worldwide consumption. Pricing in the United States will start from $257,500, excluding destination. Available separately will be a custom luggage set as well as a chronograph watch, both from Porsche Design. This represents the first time that Porsche Design has developed a chronograph for a special edition car where the watch features design elements corresponding to those used on the car. In this case the elements include the paint and carbon fiber weave found on the dial, the rotor design which matches the wheels of the car, and the winding mechanism which features a typical Porsche center-lock with the Porsche crest on the movement.